Nike abandons the mesh uppers of the sporty Air Max 270, giving the latest silhouette a chic leather upgrade. The Swoosh brand offers a trio of the new silhouette, coming in black, white or olive-green color schemes. The new AM270 Premium boasts a perforated leather body that’s defined by a number of contrasting accents. Minimized Swoosh branding arrives on both lateral sides, tongue tab as well as on the mudguard while “270” motifs rest above the translucent heel Air unit. The iteration incorporates an asymmetrical lacing system, whereas a logo-appliqued heel strap finalizes the elegant design of the pair. 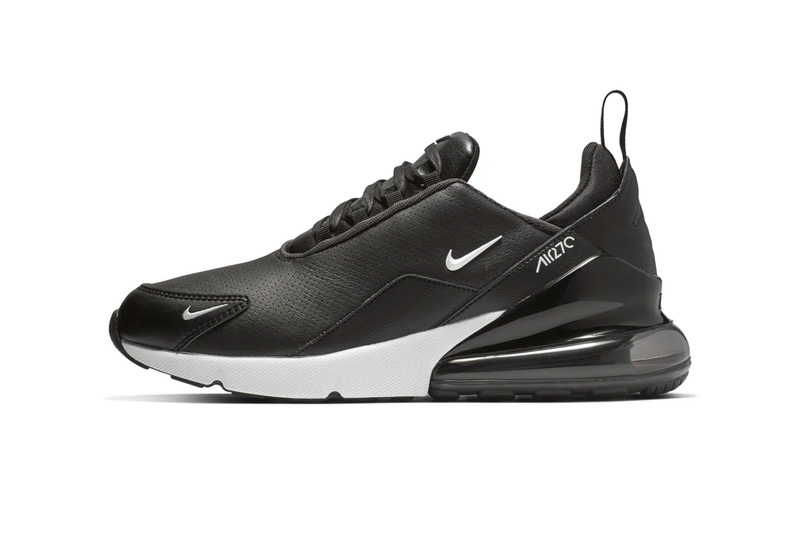 Priced at $170 USD, the elevated Nike Air Max 270 Premium is now available for purchase on Nike.com and at select retailers. Browse the shots above for a full look at the colorways. In more sneaker news, Nike reworks the Air Max 98 in a Charlotte Hornets-inspired colorway. Set off by touches of purple, pink and neon yellow.